A delicious accompaniment also known as Gostu, Gotsu, Gojju or Pico de Gallo with a twist! This came out really well!! Finely chop onion, ginger, cilantro, green chilles and set aside. Once the tomatoes are cooked, peel the skin. Exercise caution since the tomatoes will be piping hot and steaming. Once you lose the skin, use a whisk or a masher and crush the tomatoes in the water in which it boiled. But let it remain slightly chunky. This will lend body to the salsa. Add 1 Tbsp olive oil in sauce pan and place on medium heat. When the oil is hot add mustard seeds and cumin. In a few seconds the mustard seeds will pop. 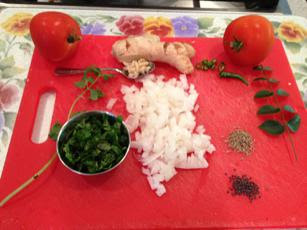 Add ginger, green chillies, curry leaves, hing and salt and allow the spices & condiments to blend for ½ minute or so. Add onions and sauté in medium heat for about 2 minutes. Make sure the onions do not turn color but just become a little translucent. Now, add the boiled, crushed tomatoes (with the water) to the sauce pan. 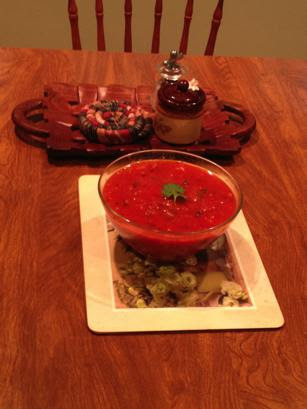 Now add ½ can of the tomato paste (3 oz) to the sauce pan. Add 1 cup of water (about 8 oz) and mix well. Let the whole stew cook in low heat for 10 minutes. You know you are done when it blends well and becomes thick as a pasta sauce. Remove from flame, add lime juice and garnish with cilantro leaves. Back to "Recipes with a Twist"